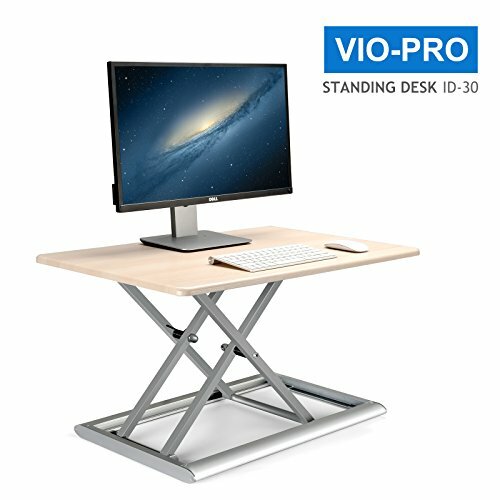 1.Viozon multifunctional standing desk provides you a simple,effective,economic multifunctional working stations.it will help to alleviate so many conditions caused by sitting for a very long time, to avoid sitting disease,back pain,neck pain and fatigue. 2.30x20inches workspace accommodate all kinds of office equipment, including monitor,laptop and so on. 3.Spring-loaded boost mechanism make raising your monitors and gear almost effortless, to switch your working status quickly and keep your work efficiency. 4.Black and light oak for your choice to match different office and home style. 5.We promise to repair, exchange or refund within one year for damage which is not caused by any man-made factors. Combine the normal desk with multifunctional desk, allow you to stand at work to alleviate the pressure from back and lumbar vertebrae. The wide working surface offers enough workspace for monitor, laptop, keyboard, mouse and so on. The combination of standing and sitting at work can improve your work efficiency effectively . Support up to 25lbs, Piling up all kinds of office equipment, and even leaning on to work. If you have any questions about this product by Viozon, contact us by completing and submitting the form below. If you are looking for a specif part number, please include it with your message.